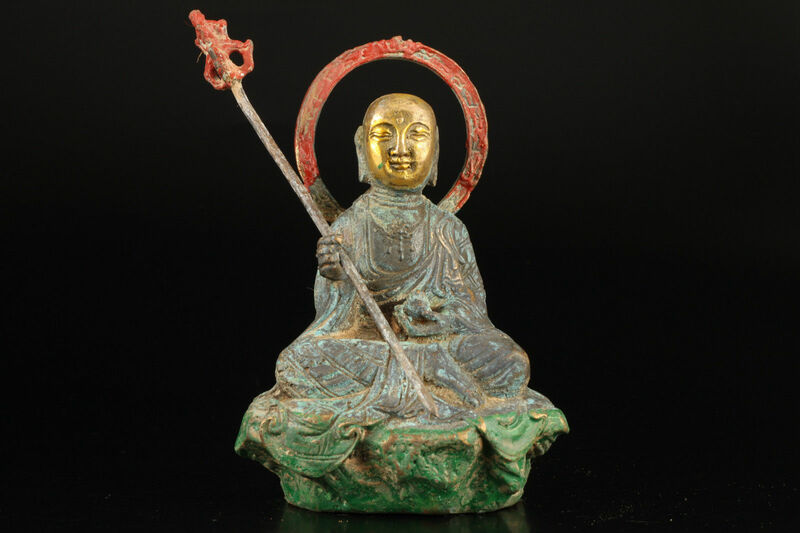 Ksitigarbha is a bodhisattva of Mahayana Buddhism. In China he is Dayuan Dizang Pusa (or Ti Tsang P’usa), in Tibet he is Sa-E Nyingpo ས་ཡི་སྙིང་པོ and in Japan he is Jizo. His name may be translated as “Earth Treasury”, “Earth Store”, “Earth Matrix”, or “Earth Womb”. 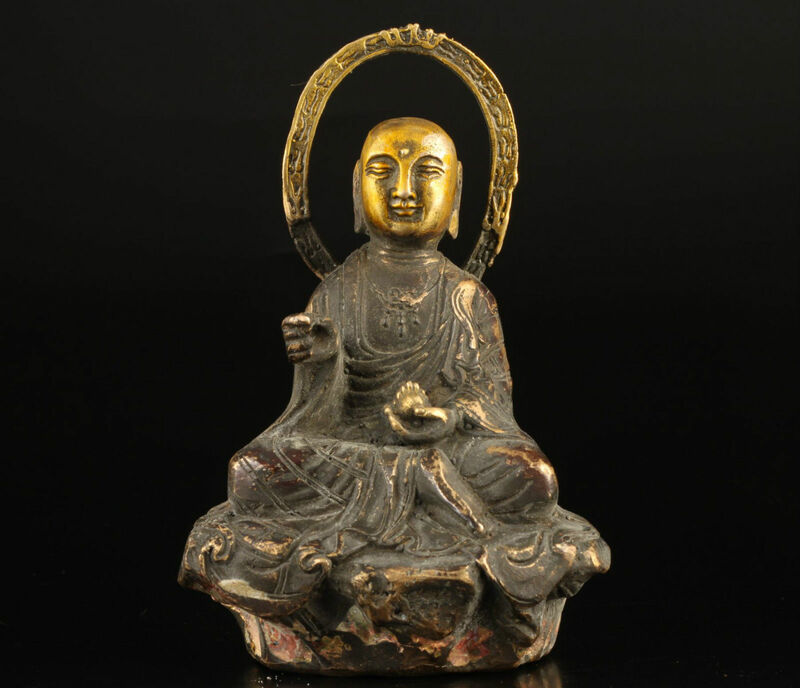 He is one of the most popular of the iconic bodhisattvas, especially in east Asia and Japan, where he often is called upon to guide and protect deceased children and fetuses. The short Ksitigarbaha mantra in English is “OM AH KSHITI GARBHA THALENG HUM” and the long mantra is “CHHIM BHO CHHIM BHO CHIM CHHIM BHO / AKASHA CHHIM BHO / VAKARA CHHIM BHO / AMAVARA CHHIM BHO / VARA CHHIM BHO / VACHIRA CHHIM BHO / AROGA CHHIM BHO / DHARMA CHHIM BHO / SATEVA CHHIM BHO / SATENI HALA CHHIM BHO / VIVA ROKA SHAVA CHHIM BHO / UVA SHAMA CHHIM BHO / NAYANA CHHIM BHO / PRAJÑA SAMA MONI RATNA CHHIM BHO / KSHANA CHHIM BHO / VISHEMA VARIYA CHHIM BHO / SHASI TALA MAVA CHHIM BHO / VI AH DRASO TAMA HELE / DAM VE YAM VE / CHAKRASE / CHAKRA VASILE / KSHILI PHILE KARAVA / VARA VARITE / HASERE PRARAVE / PARECHARA BHANDHANE / ARADANE / PHANARA / CHA CHI CHA CHA / HILE MILE AKHATA THAGEKHE / THAGAKHI LO / THHARE THHARE MILE MADHE / NANTE KULE MILE / ANG KU CHITABHE / ARAI GYIRE VARA GYIRE / KUTA SHAMAMALE /TONAGYE TONAGYE / TONAGULE / HURU HURU HURU / KULO STO MILE / MORITO / MIRITA / BHANDHATA / KARA KHAM REM / HURU HURU” which is commonly used to avert danger, or to avert problems of any kind. It is said that even reciting this mantra just a few times will help you. Please also see “The Sutra on the Original Vows and Attainment of Merits of Ksitigrabha Bodhisatta” for more on Ksitigrabha and Tibetan hell itself. Ksitigarbha is the savior of souls who have to suffer in the underworld, therefore his statues are common in cemeteries. Pebbles are often placed next to statues in the hopes that it will lessen the time children spend in the underworld. His features are commonly made more baby-like to resemble the children he protects. He is also believed to be one of the protective deities of travelers, and firefighters as well. Hopefully he might be able to work some of his wonders and get the Tibetan and Chinese children who might end up in Lao gai prison, executed and/or completely disenfranchised from their own culture and heritage out of the hell their parents have endured. 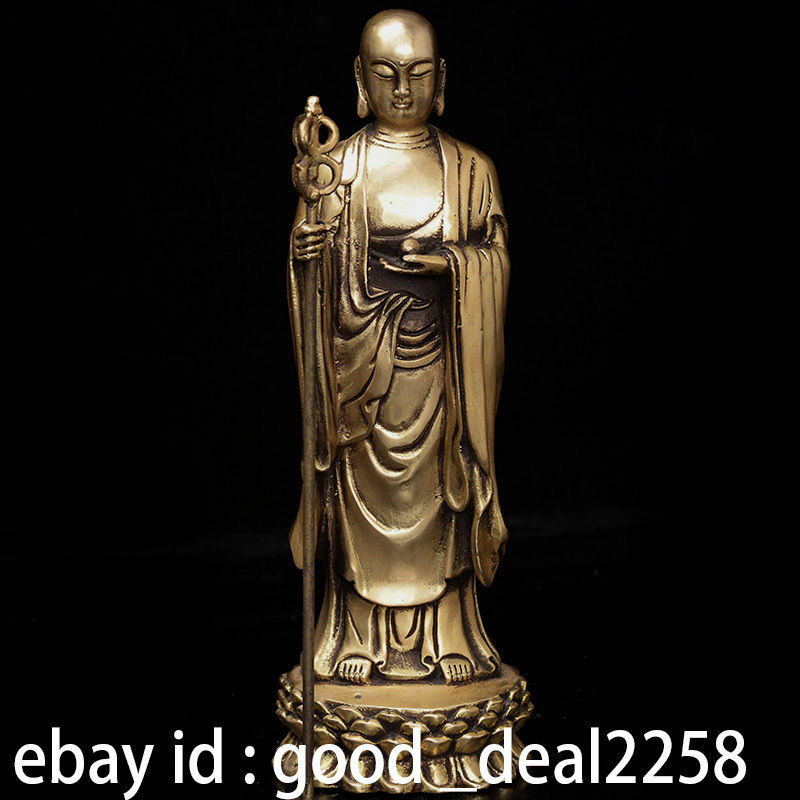 Ksitigarbha sales on Ebay, have been steadily increasing since I began tracking them in 2015, as well as reporting people’s things that were being sold as stolen to Ebay. These types of religious pendants are most often sold as new, but the wood is so durable, they could be quite used and no one would ever know. I’ve bought a dozen of these now and 8 out of 10 had enough damage that I would call them definitely used before. I’ve also tried wearing one around the house on my waist and it took weeks to show any kind of damage to the naked eye though I was outside gardening and doing whatever with it on. Wooden religious pendants with scratches and damage showing previous wear. Most of these “cinnabar” pendants are not cinnabar at all but a resin that doesn’t change color like real mercury ore in sunlight nor expose people to the hazards of this toxic metal, but that is not to say it is all good if they are used pendants from a religious prisoner or robbed from someone’s grave. In many cases pendants are being sold without string attached at all, which in the case of Chinese who are so fond of knots and silk, is very, very strange. Particularly for something considered to be “sacred”, to be sold this way is a red flag within itself. Does this look new to you? Look at the top edge in particular. 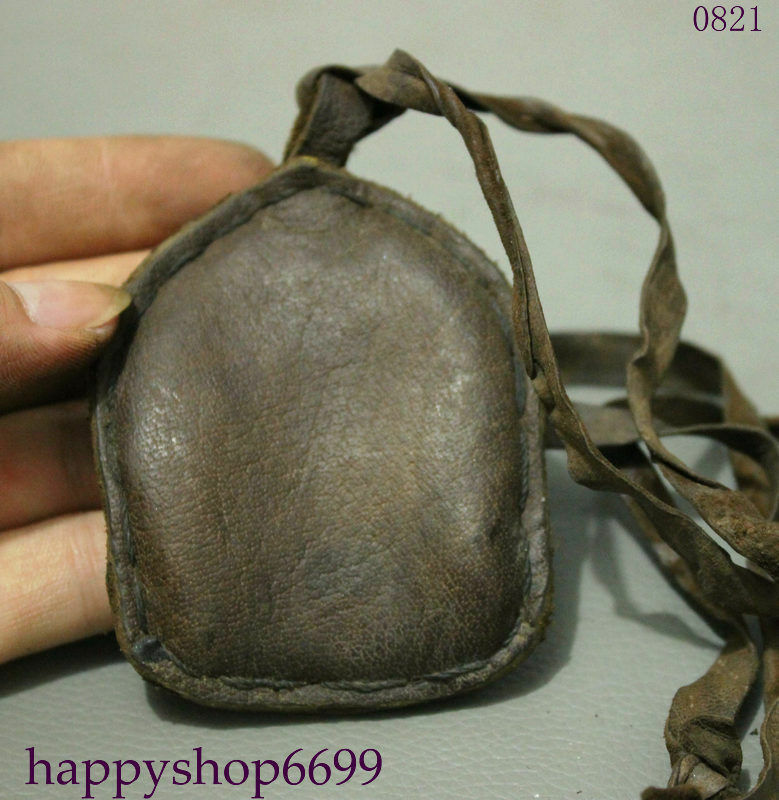 Taken directly from a monk’s neck- the leather shines from grease from being worn, darkened by it and age. Ksitigarbha carries a staff to force open the gates of hell and a wish-fulfilling jewel to light up the darkness. Said to resemble whom he protects, he’s depicted with youthful features, a bald head like a baby’s and even some baby fat. The same statue, painted differently, in which he is missing his staff. Again Ksitigarbha is missing his staff. Below is the same statue as above, but he has his staff. Assumably when these were taken from many a Tibetan (and/or Chinese) family, not much care might have been taken, thus many of his staffs were lost, damaged or whatever along the way. In this depiction Ksitigarbha has no staff (nor has he lost it along the way), only the wish-fulfilling jewel. 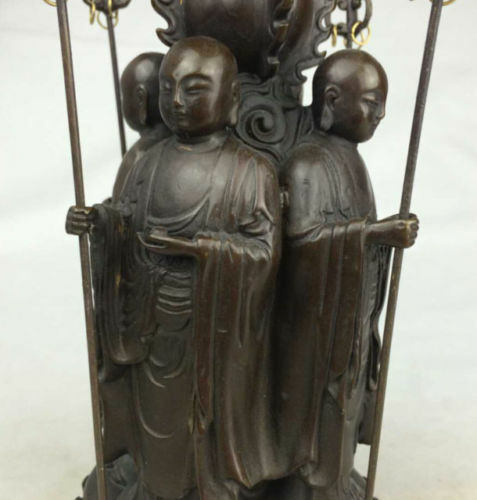 The statues being sold above are without his staff, while the statue below is. Paint over copper. 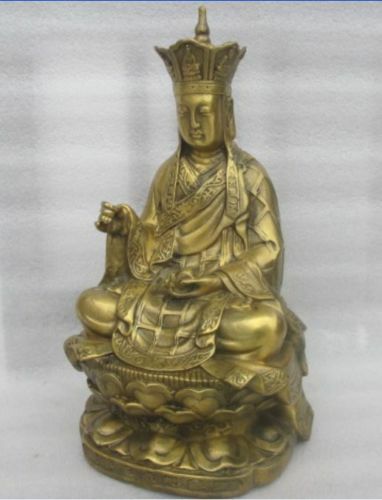 Ksitigarbha is also frequently depicted resting in contemplation on a bench with a third eye prominent on his forehead, but then I could be wrong and perhaps this is Xuanzang, another very important Chinese Buddhist monk. 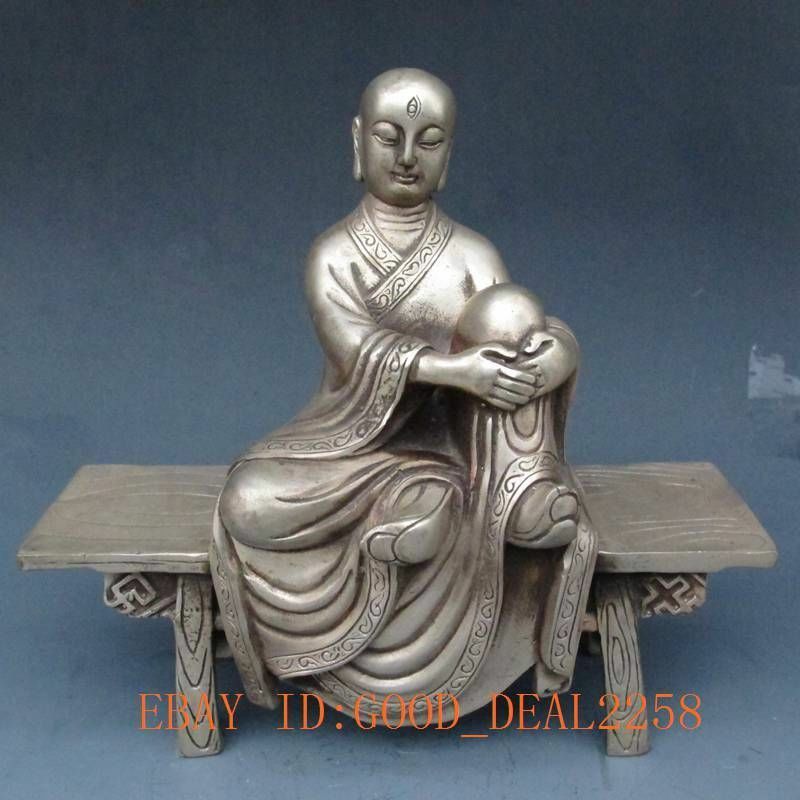 In addition to using each other’s photographs of items, sellers who deal in huge volumes like good_deal2258 with many, many multiples of the same statues use several sets of different photographs to sell the same item. 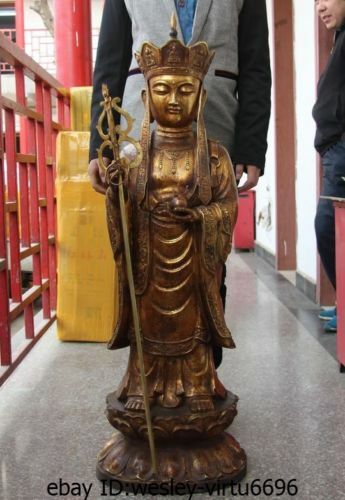 Also this exact same dealer is selling such huge quantities of antiques, both Tibetan and Chinese, that it easily would reach Ebay’s $30,000 cap on what a seller can sell in a year within a week’s time. Though this is a major shop who does serious volume and many Chinese sellers don’t sell that much, it all adds up to quite a lot that the Tibetans will never see again. All the money goes into PayPal accounts which are fairly anonymous and in US funds. Presumably since none of the goods are ever shipped from Tibet nor sold by Tibetans or monks, they never see a dime. 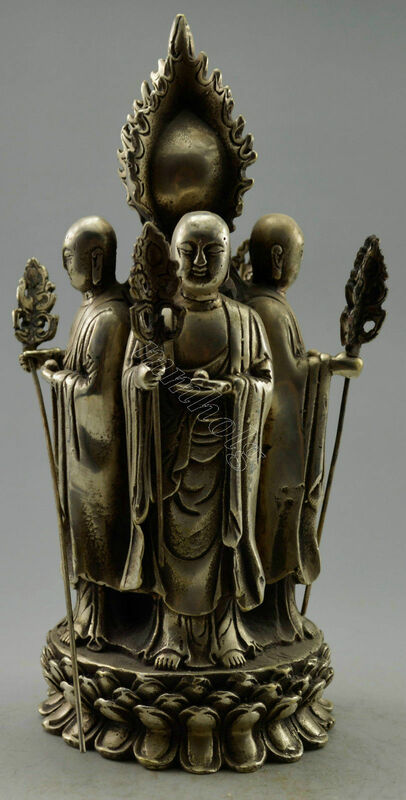 Above is a larger statue of Ksitigarbha at 42 inches that would have probably been placed near the entrance of a monastery- definitely not something that was personally owned, but another one of those items taken from communal places of religious worship. As you can see, there are just two shops that seem to have all of these statues, and because they are using the same background of outdoor hallway with red fencing, the two shops are probably owned by the same people. 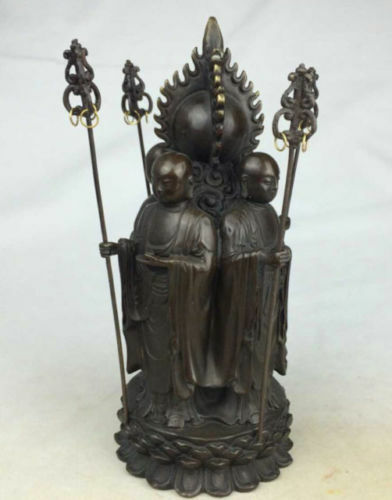 It doesn’t sound like they just randomly bought these Ksitigarbha statues from someone it Tibet if they own 5 of them (& the only ones for sale) not to mention the ones that they might have already sold; and it doesn’t sound like any resources are being redistributed to the people themselves if only one person or family has control of all and receives all the money from sales of such; and it certainly isn’t even a free market if there is only one who has a monopoly over the entire stock of these statues and is able to fix prices on all. 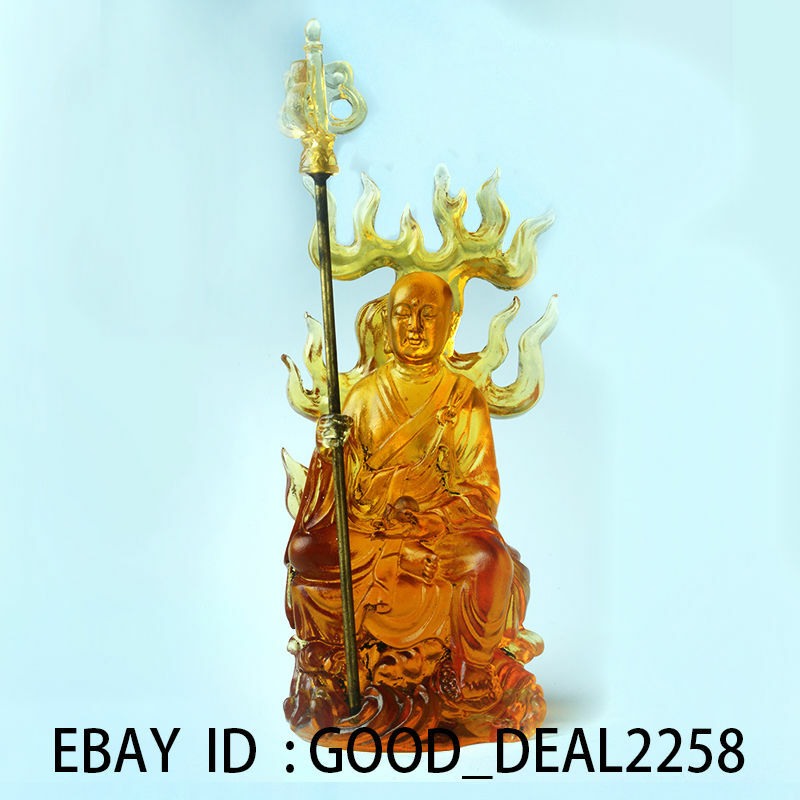 One of the really sad things is that the “Honesty shops” or any seller’s name with honesty in it seem to be the ones which are completely full of Tibetan and religious items which are all so rare and sold so cheap that they are surely not such an “honest” businesses. If you have two shops with the same items you are selling at the same prices, does that sound honest? Why would you do that? Isn’t exactly a free market if you monopolize and often times flood it, let alone the other unscrupulous business practices going on. 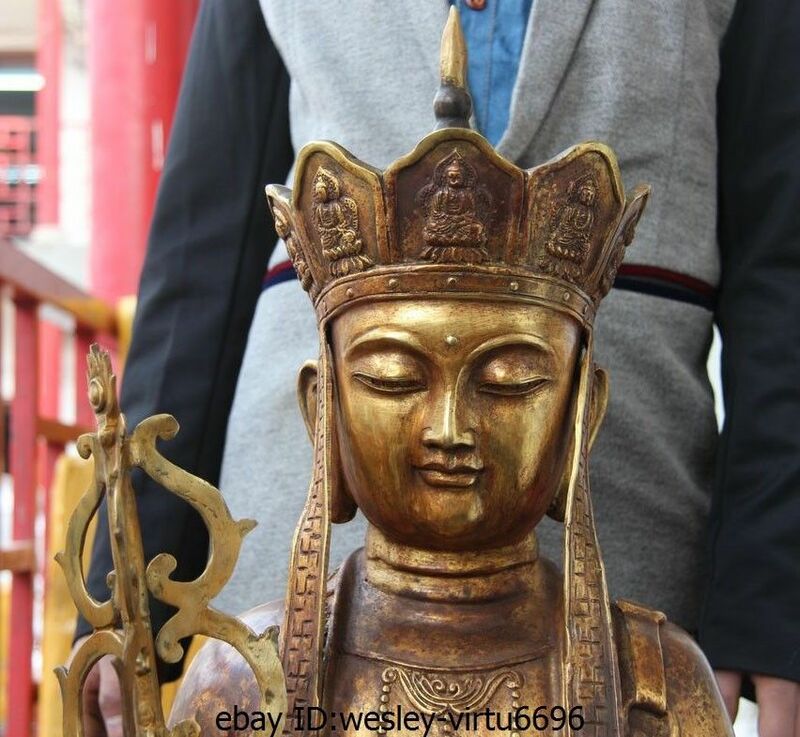 This Ksitigarbha statue is made of the highest quality fired clay in the world called Dehua porcelain from Dehua, Fujan Province, China where the finest Blanc de Chine has been made for centuries. 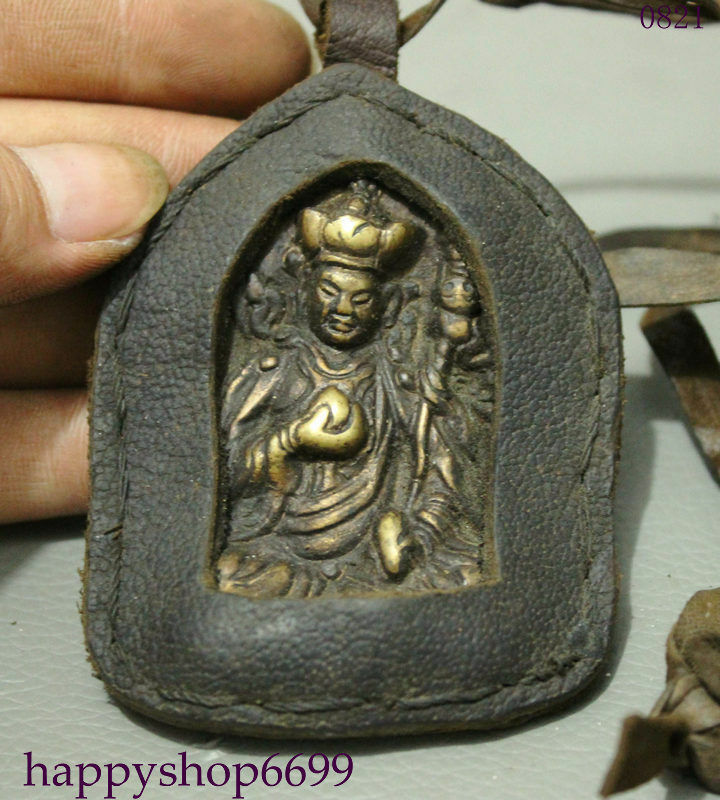 Though this was definitely made in China, this is not to say that it wasn’t owned by rich Tibetans or a monastery who had specially imported it, though the Chinese have also desecrated many of their own religious sites and robbed their own rich too. Newer thangkas showing heavy Chinese influence that were also woven by a machine, which indicate these were probably confiscated by the government relatively recently.